Compagnie Maritime Monégasque (CMM) and Damen Shipyards Group (Damen) have joined forces to introduce a fast, safe and reliable Fast Marine Access crew change solution for the Brazilian market using a Damen FCS 7011. The solution looks to transfer personnel between shore and the ever more distant deep sea offshore platforms and flotels. The FCS 7011 focuses on increased safety, cost reduction and comfort, while offering a high speed solution to complement existing helicopter transfers. In the development of the Fast Marine Access, Damen had two main points of focus – the increasing distance from shore of offshore operations around the world and the sea conditions in which they take place. Working with leading maritime research organizations including MARIN, TNO and the Technical University (TU) Delft, Damen undertook detailed studies of anti-rolling measures and marine access workability. CMM is a market leader in Fast Offshore Support vessels and operates a fleet of Damen Sea Axe fast oil spill response vessels in Brazil. The Fast Marine Access vessel’s combination of speed and innovation to create efficiency is a perfect match with CMM’s three focal points. The DP2 classed vessel will be the first of its kind to maintain high speeds in harsh weather conditions where motions are minimized by the active ride control system. 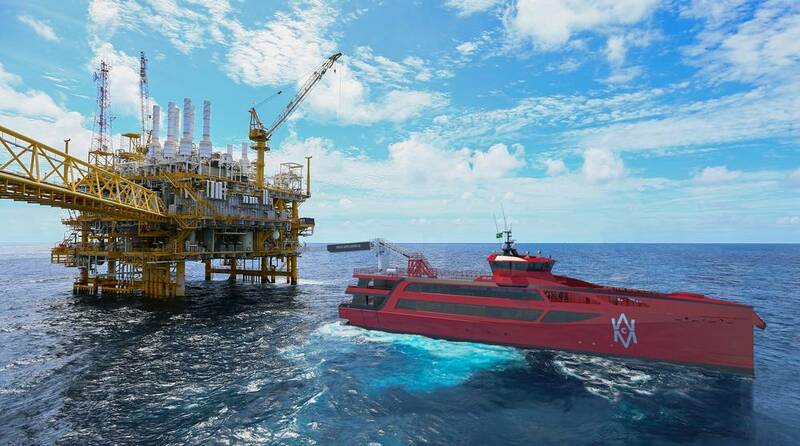 The vessel is fitted with an integrated motion compensated gangway and a gyro stabilizer to provide a safe, reliable and high capacity transfer. The integrated approach of the key equipment enables a more dynamic approach and settlement of the gangway during the transfer phase, maximizing operability. Currently the tank test phase is concluded at the TU Delft to verify the behavior of the design in both transit and transfer conditions before continuing to the engineering phase.